Cypress Gardens Corridor Study Debrief | Winter Haven Economic Development Council, Inc.
Last Thursday Bruce Lyon with the Winter Haven Economic Development Council (WHEDC) provided Chamber members with a debrief on the findings of the Cypress Gardens Corridor Study. This study was done for the WHEDC through a partnership with the Polk County Board of County Commissioners and was conducted by Dr. Joshua Harris and The Lakemont Group, a real estate and economic consultant out of Orlando. Dr. Harris is also a professor at the University of Central Florida Dr. P. Phillips Institute for Research and Education in Real Estate.The impetus for the study stems back years to the community’s desire to see a development and growth plan in place for this corridor when LEGOLAND®​ Florida announced it’s arrival (and maybe even before that point). It has taken some time to get everyone moving in the same direction (remember, so much of this road zigzags in and out of the city/county limits). As you will read, the information provided in this study shows a strong business case for the highest and best use developing the corridor as a tourist destination to maximize the positive economic benefits such as employment growth, local and state tax revenue growth, maximum property values as well as maximum quality of living and amenities for Winter Havenites. A summary of the debrief follows, but if you would like to watch the presentation a link to the youtube video is below.The study area for the corridor is shown below. 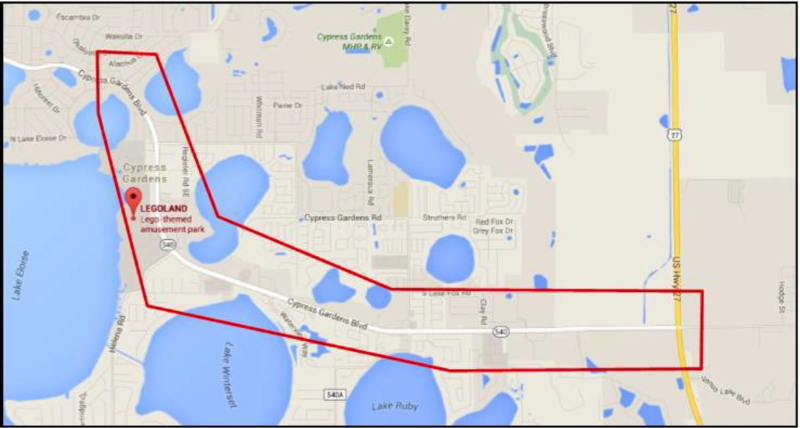 This area is defined as the area from Overlook Drive to US Highway 27 along Cypress Gardens Blvd (State Road 540). It comes as no surprise to any of us locals that the dominate feature of the corridor is the presence of LEGOLAND® Florida Resort. While LEGOLAND® Florida Resort (LLFR) does not publicly disclose their attendance numbers, Dr. Harris estimates an annual attendance of at least 1.5 million guests based on info from knowledgeable parties and their parent company, Merlin Entertainments plc financial disclosures. LLFR’s visitors come from around the globe, with many coming from Florida via Highway 27 and I-4, the bulk coming from the east and Orlando area. Where are all of those visitors? The corridor lacks adequate hotel lodging options to support additional entertainment/tourist activity development and is likely constraining attendance at LLFR itself. The corridor and the greater Winter Haven/Polk County area are generally not perceived as a “tourist destination” and lack an adequate range of options for a mutiday stay. This of course is a circular problem with the lack of adequate hotel rooms to service such development and lack of entertainment options etc. Another key note from Dr. Harris – Polk County is highly regarded by investors nationwide. There is a significant demand that could be captured such that the need for hotel rooms could exceed 1,200 net new rooms by 2025. There is significant evidence to support at least 1, and perhaps as many as 3 upscale, full-service restaurants in the corridor today given existing demand. There is a strong demand and a large available market for additional entertainment facilties and activities to compliment LLFR. The corridor has a lot of growth potential; however it needs significant improvements in terms of appearance, sense of arrival, linkages and overall branding and theming to make such growth potential a reality. The local Winter Haven/Polk County market living within a reasonable drive time to the corridor will reap the direct benefits of additional entertainment and restaurant options while also serving a base of additional demand for new establishments. So what are the WHEDC’s action plans? To view the presentation made by Dr. Harris to the Polk County BOCC, click here. To view the Corridor Study in its entirety, click here. (May take a moment to load, it’s 103 pages). To view Bruce’s presentation at the Chamber click here.